I’m sure most people have experienced this. There’s always a magic-wielding finger-waggler who gets a bit overzealous with his AOEs. This entry was posted on Wednesday, July 20th, 2011 at 12:00 am and is filed under Comics. You can follow any responses to this entry through the RSS 2.0 feed. Both comments and pings are currently closed. Universal campaign jokes are awesome!!! Love the Cap’t response too! Nope, it’s always the %$# who throws the grenade into the car. 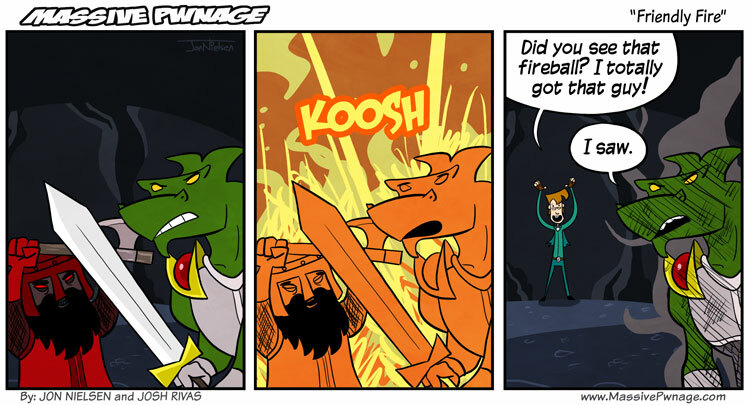 Hey, my kobold swordsage did something similar to one of my allies, but it was on purpose. I needed a larger explosion and he had fire resistance. So, I attacked him with Death Mark and made him explode with fire to kill the swarm of insects. It was strategy! i did crit in my attempts to strike him for non leathal damage with my spiked chain… but it worked well. Spellswords: get the best of both worlds. Cast without hitting your allies, and still able to hold your own against the damn ambushes. That’s why I’d take Poppy. Invulnerable to everyone -1. Mine always tend to to be the opposite. My gnome Alchemist in Pathfinder has a tendency to hit himself with bombs or just shove said bombs into enemies mouths. Silly gnomes anyways. pathfinder gnomes are really dark, the reason the are so mischievous and silly is to avoid “The Bleaching” if gnomes dont experience new things they will lose their color and eventually find breathing to labor some of a task and just stop. And thats why pathfinder gnomes are so awesome! “That’s why I told you reflex was a good save to invest in” you tell your friends after they die to your maximized fireball.